If HCC is a family, then Laura McBride is an out of state cousin. 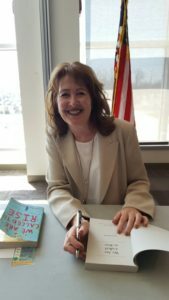 The community college professor from Las Vegas, Nevada, appeared to be at home in her surroundings during her visit to HCC as part of HCC’s first One Book One College program. 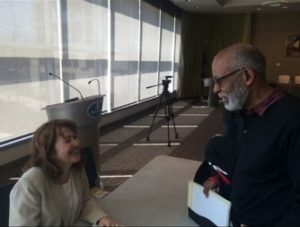 From sharing teaching styles with HCC peers like English Professor Aubrey Moncrieffe, to fielding questions from curious college students, HCC was an environment that she seemed to acclimate to easily. McBride has gained national recognition for her debut novel “We are Called to Rise”, the title of which is taken from a poem by Emily Dickinson. Told in several voices, each varying in perspective and featuring a multitude of social issues, McBride captures the confusion and heartbreak of daily life just as gracefully as she captures the reader from the first page. The novel incorporates contrasting narratives from a middle-aged woman with marital problems, to a social worker trying to make a difference, to an injured soldier dealing with his new life, to a young boy juggling two cultures. It touches on issues ranging from political persecution, to poverty, to PTSD, with characters that are easily relatable despite their different ways of life. HCC has organized several events in March and April that will concentrate on the topics raised in “We are Called to Rise”. 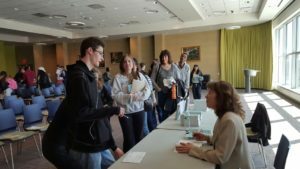 These were kicked off March 28, with a book discussion hosted by Professors Rebecca Adams and Eleanor Bloom in the Events Center at Beacon Hall. Students from their English 102 classes engaged in roundtable analysis of the novel and spoke candidly about their take on the text. Later that day McBride gave an inspirational speech on her journey as an author and signed copies of her novel for students and staff, all the while smiling and engaging everyone she spoke to. Every week in April HCC will be host to an open discussion on varying subjects that are present in the novel. All are held in the Events center and free to the public. Students and faculty alike explored the symptoms and causes of PTSD on April 7 (2:00 p.m.), will look at the good and bad of small business ventures on April 13 (11:00 a.m.), domestic violence in the novel and in real life on April 18 (12:30 p.m.), and police use of deadly force on April 25th (12:30 p.m.). One Book One College has given HCC readers and writers an exclusive chance to pick the brain of a rising artist, and has designed forums for everyone to get involved in discussions of matters that matter right now.